The Godiva Festival free entertainment for Coventry. First of all I would like to thank Coventry council for putting this event on every year. My family and I have enjoyed this wonderful weekend for years. But my outlook now is OMG it’s March I need to get sorted!!!! Yes it’s the run up to the festival I’m running out of time, so much to do like sorting marketing, branding, signage, pictures to tell everyone which designs there are. Sorting two kits, so two lots of everything paints stencils glitter brushes, glue, brush off brush, water container, hair glitter, hair chalk, cosmetic glitter, cleanser, wipes, money bags, books to make and laminate, check last years signs find them first!!!! making bling for children which takes two days to make. 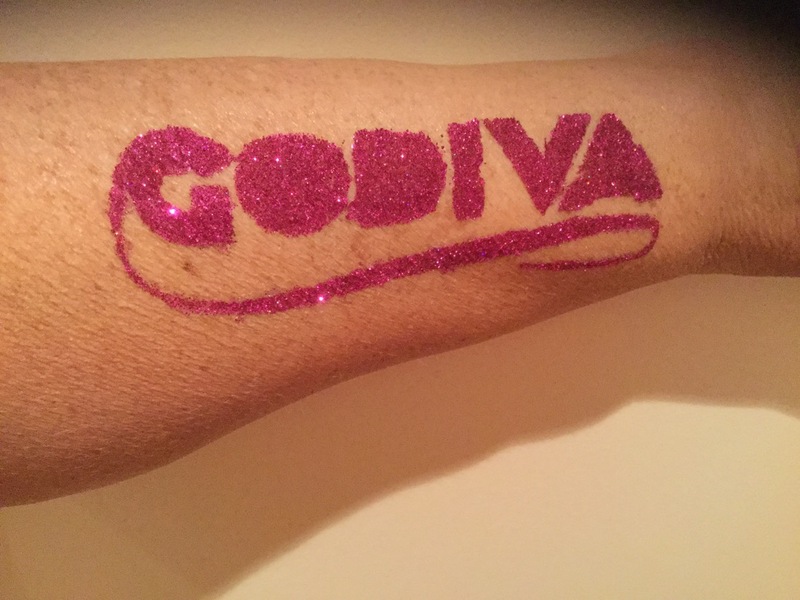 Cutting stencils out finding designs I like, also cutting the Godiva Festival logo out people love it a designer logo at the festival in a glitter tattoo. Buying lucky dips and then wrapping up, some things I make so again more time needed to keep on track of July. Everything is in twos as I have my wonderful dream team buddy face paint buddy Sophie who helps me every year as she is so mature helpful and trustworthy I just love working with her. As I’m old I can mess around as I’ve nothing to loose and she looks at me in disgust which is really funny, she’s the young one that should be doing what I do!!! Sophie works really hard to help everyone around her she surprised me this year by making me some really cool leaflets for parents to fill out so we can get the children onto the social media to help with ratings all good she’s amazing. She also got Noel her fantastic boyfriend to come and help me, he too is amazing. 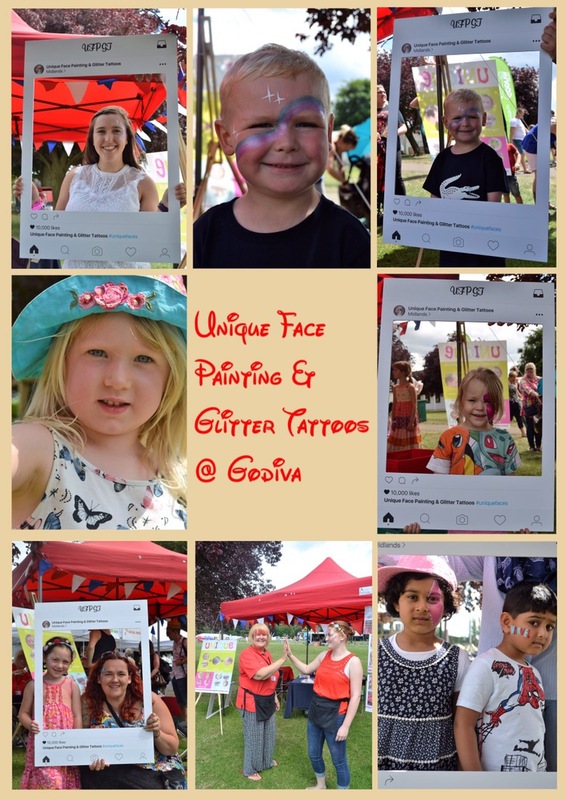 Coventry’s Godiva Festival has won another top award – just days before thousands are set to flock to the War Memorial Park for three days of big-names in the music and entertainment world. All for us folks in Coventry. I pray for weeks to have good weather again another box ticked, thank goodness, that’s one we cannot control we have to hope for the best it can be. So two weeks before the event I’m now checking to see if we have enough stock, well I think so but I will buy some more just in case we run out, I make more pics so it shows that glitter is now for teens Mums and Dads, it’s for everyone, then decided we need more bling so make plenty more takes hours upon hours, but look fantastic when finished for that festival look. Coventry’s Godiva Festival is set for a Sunday circus spectacular, thanks to the team behind the bid to be UK City of Culture in 2021 the Godiva Festival has this year taken part in a European exchange programme, sharing the region’s home grown talent with one of Coventry’s original twin Kiel Germany also the worldwide Bhangra sensation, Panjabi MC, my friend Parm saw this and loved it she was surprised to see him here with us. Whoop. Coventry Godiva Festival is billed as the UK’s biggest free family music festival and has been going for 19 years. Based in the city’s historic War Memorial Park, for three days the event offers great live music, entertainment for everyone, food and drink, craft stalls, and children’s fun fair, face painting by the dream team, plus lots more community based partners. All coming out for this amazing event, to enjoy that spirit of Coventry that grips family and friends into the vortex of summer and the Godiva weekend that people so look forward to for weeks. Main Stage – A mixture of big names and local talent! Rock/Rhythm Tent – On Friday night, the tent becomes the Rock Tent, full of rock and metal, and by Saturday, rap, grime and acoustic sets take to the stage. 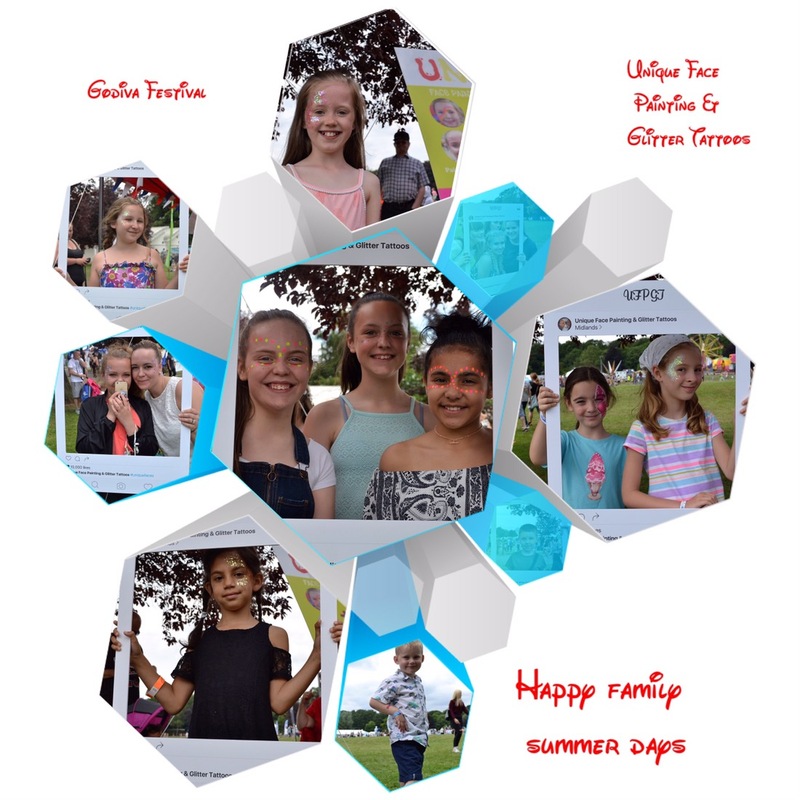 Paradise Tent – Family comedy, street theatre and young entertainers, plus a silent disco! Acoustic Stage – Acoustic sets. The Urban Youth Tent features music and general advice for young people in the city. 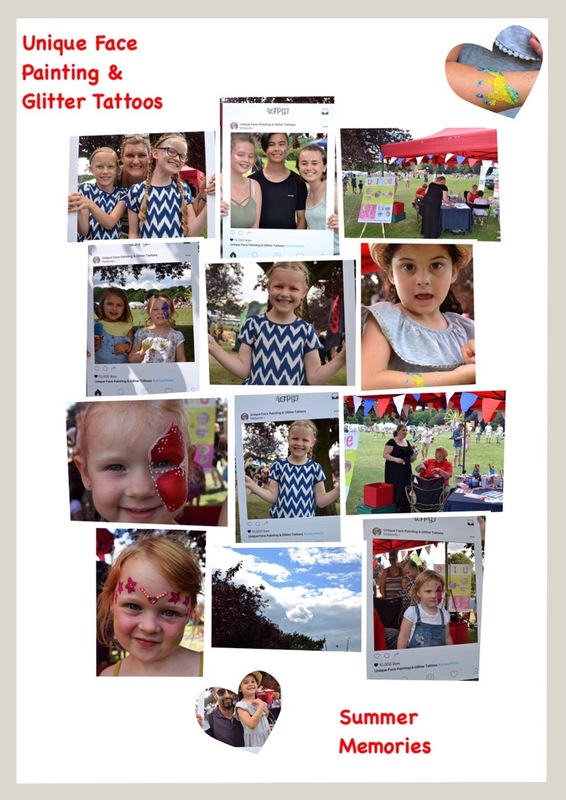 We had the wonderful Laura from the Coventry Telegraph come and asked the parents how they were enjoying the festival and taking pictures of the children which went onto the webpage. Laura came to speak to us on both days of the event she had the glitter festival look and looked amazing too. So did I or did I not that’s the question? Well yes we managed to pack away walk back up the hill to the entertainment field a watch The Darkness, they were on fire fantastic it was still very sunny he also wore a foil suit!!!! Which he had to strip to waist pretty quick, the whole show was packed with energy and just brilliant. People started to throw the usual in paper cups so we decided to make our way home. We popped into the ska tent I managed a bit of body wriggling I had to control the bingo wings though. Then a nice ice cream as I’d lost my voice, ugh, then realised I had to drive home great, after a long day but I loved it all and Sophie and I make a Pact same time same place next year we high five and have the same smile as last year. 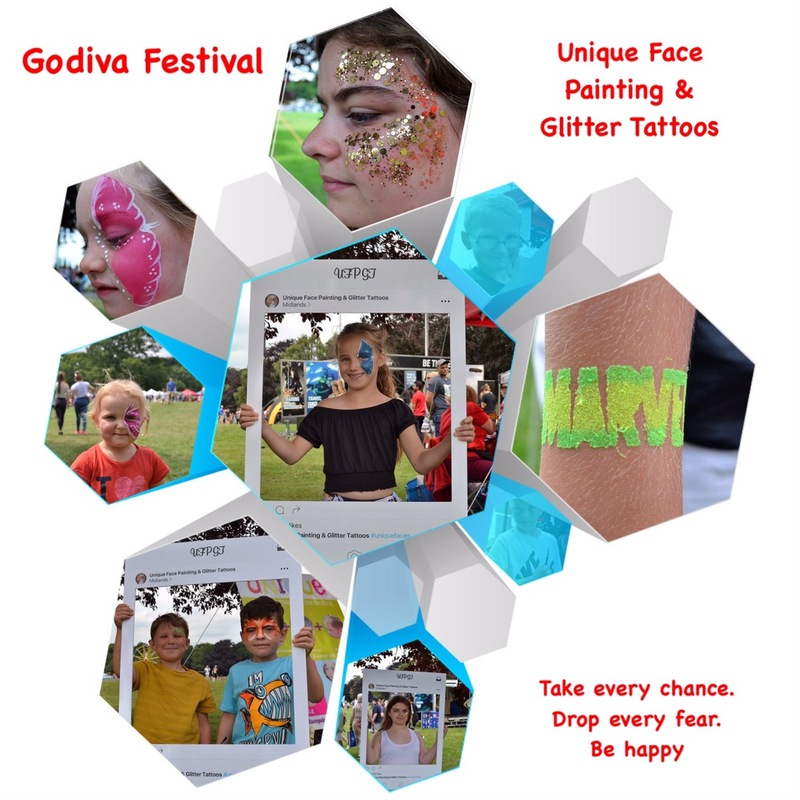 On Monday to my surprise I had a call from Liv, from Coventry and Warwickshire BBC Radio asking if I’d have a chat to Jo Tidman about The Godiva Festival STUNNED is the word but yes please. So I chatted to Jo and I just have a magical bubble every year, of that happy feeling everyone has.